Disappearing Rails: why give a damn? Updated 12/5/17 – On November 12, 2017 “Disappearing Rails – A Plea To Lawmakers” was released on Facebook. It has accumulated 5,489 views and 223 shares. Disappearing Rails Plea To Lawmakers from Mountain Girl Photography… on Vimeo. On Monday, November 13 and 14, 2017, all Ulster County legislators received a copy of the Official Release on Vimeo, along with a password. This was so stats could be recordered and number of views would be accounted for. In the email, they were made aware views were being tracked. Only 25 people had access to this link: producers, Ben Rounds and myself, along with the 23 Ulster County Legislators. The lawmakers had made up thier mind. By a majority vote they decided to go forward with the resolutions that brought the demise of 11 miles of Ulster County tracks, forever severing the Catskill Mountain Rail Corridor. Stats page for Disappearing Rails views on Vimeo with password. Proof is in the pudding. An almost accurate record of that meeting and vote that night can be found at this Daily Freeman article. My candid record of that meeting, including intimidation tactics, Richard Parete’s vote change and Kathy Nolan’s attempt to change my own mind can be found on this facebook post. Until the rails are removed, the fight will go on. Until. Please visit the Ulster & Delaware Railway Revitalization Corp website and donate to their legal fund and the final efforts to Save The Rails. So you are wondering why you should care about the railroad of Upstate New York when California and Montana are burning and Florida and Texas are drowning. I get it. I sometimes wonder the same thing myself. Then I make a donation to flood or fire victims and move on with my day. After all, we can’t fix it, right? The state of our country, politically, physically and morally is so precarious right now. I would like to stick my head in the sand and pretend like none of it is happening until a flame or a flood actually reaches my doorstep, or until the insurance drops my family. Then I will get angry and all kinds of scared. In the meantime…there is something I can do, we can do. Like donate to the local food pantry, raise money for animals waiting for adoption or vote on a local level believing this vote will actually count. Also, I can pitch a fit to keep the Ulster County rails in place. At least until I actually see the steel being carted away. I do this not only because I am in love with trains. I do it because of the incredible blow it would mean for our economy and loss to our future generations if these rails were to be permanently deleted from our landscape. Trains and minimalism go hand in hand. Well, to address the former, Millennials are reverting back to foot and pedal travel, and car-sharing. The throw-away culture of my generation is becoming a thing of the past. The core hipster mentality is sweeping the nation: Minimalism. I can back up the above statement . I’ve traveled Amtrak all over the country. Most recently, between NYC and Baltimore. The amount of young people hopping the train to get out of the city boggled my mind. One vintage Woolrich-clad group was particularly vocal about the horrors of bus travel and the expense of renting a car. But the train only takes one out of the city into the Hudson Valley. After all, it can’t travel along the west shore of the Hudson. Oh, wait, yes it can. Proof positive this past weekend, Oct. 14 & 15, when the Amtrak Autumn Express found its way tunneling under then crossing over the Hudson, for a sweet and well-spent $169.00 a ticket. I know of a train enthusiast that was flying out from California and spending two nights in a NYC hotel to make this historic run. Wait, I’m getting ‘off track’ here…entering into the reduced environmental impact trains afford us…Have you seen the amount of cars overflowing the trail head parking areas? Imagine if the AirBnB-ers could car-share to Kingston and travel by train to innumerable destinations in the Catskills? They could plan to spend the week in one town, or if they want to explore, they can put on their hiking shoes. Imagine climate-conscience youngsters hiking from Pinehill to Roxbury finding it’s just too long of a trek for them. They could, theoretically, take a train, do dinner at some overpriced, hand-cut-ice-serving-boutique restaurant and head back to their AirBnB one county over. Imagine skiers leaving Kingston, destination Belleayre. This is not a far-fetched stretch (well, maybe the completion of the proposed resort is). In our not so distant past, trains used to carry vacationers to the doorsteps of Catskills’ resorts. Even Amtrak sees the positives of a rail line heading up country to deliver riders with the new and highly successful Winter Park Express weekend train between Denver Union Station and the high-country ski resorts. Imagine in vogue upstate nuptials taking place on the train. Considering the weddings exploding all over the Catskills, imagine photo shoots, rehearsal dinners or even bachelor parties on the train. Imagine all the intoxicated wedding-goers having a safe option for commuting. Imagine none of this happening if the rails are removed. It won’t happen tomorrow, next year, or 50 years from now. Because once the rails are ripped up they will never be re-built. Thank you to George Bain and Ken Anello, Co-Chairman of UDRR Corp for these numbers I used for these beautiful shareable MEMEs!. Another issue holding up all we can imagine for the rails (for example Rail Explorers) is the FEMA repairs Ulster County has yet to make after the severe flood damage between Shandaken and Phoenicia that Irene left in her wake. I’m sure Thomas Cornell, the businessman responsible for the commencing of Rondout and Oswego original railroad construction in 1866 is restless in his grave. As are the many men who sacrificed blood, sweat, tears and even their lives to build these rails only 150 years ago. Should the rails be ripped up, I will have to tell my daughter, who was blessed with the travel bug and an adoration of trains like her mother, that the rails going through her town may not be there one day. That the precedent being set by removal of this seemingly unimportant set of tracks is that rail travel will soon be obsolete. That maybe when she, or her own daughter, is 21, soul-searching and forced by her inherited wanderlust to travel West, she won’t be able to cross this country on a train. 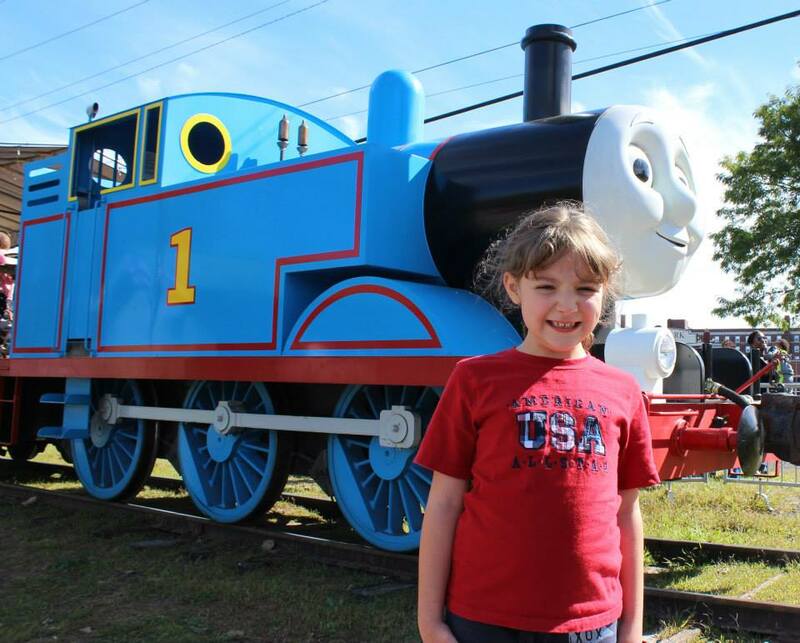 My daughter on CMRR’s ever popular Thomas the Train a few years ago. Now to address the economical positives of keeping the rails in place, I mention my personal favorite: sustainable tourism. This article ’38 Reasons To Save The Rails’ is much more detailed than these few paragraphs, and compiled by experts, so please be sure to click on the link and read. 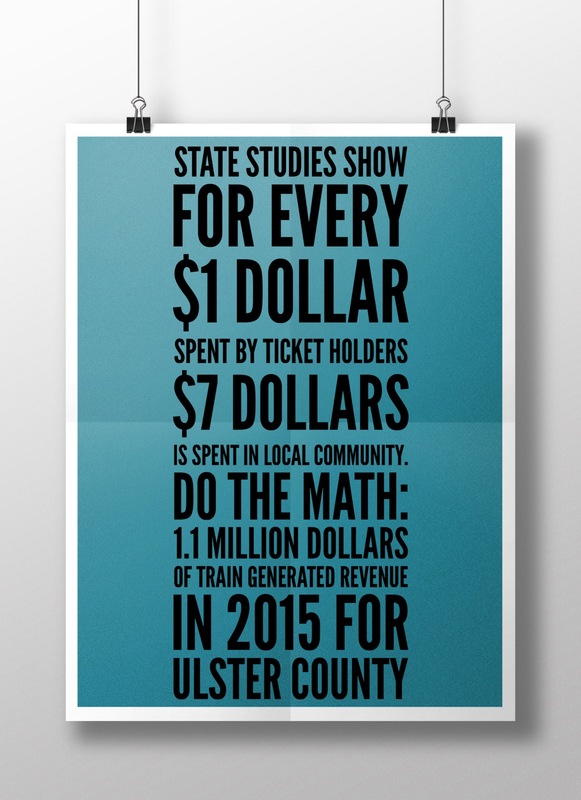 Even with only heritage rail companies running on sections of the Ulster and Delaware corridor, the amount of money being brought to these towns served is indisputable. Here are CMRR numbers for their last full season, 2015. If you are reading this and don’t know where Arkville is, well, that’s my point. There are small towns all up and down the state funded Scenic Byway (Rt. 28) where regular, working people live. People who own shops, cafes, real hotels, etc., that would only benefit from a train delivering hundreds of potential customers to their doorstep. Folks that never see the tourist dollars spent in Kingston. This is what I mean about economy. This is what I mean about making a difference locally. It really is not that complicated. So you can’t damn the floods, or put out the fires, or fix a Texan’s home. But you can vote for rail/trail supporting legislators. You can attend a rally and make some noise. You can even contribute to the cause by actually buying a ticket for one of the train excursions still offered, and encouraging your friends to do the same. By the way, The Polar Express is back! Thanks to a temporary permit procured by CMRR for short excursions out of Kingston that began this fall. That’s a mere 25,000 person guaranteed increase in ridership during the months of November and December. To take a train ride in Ulster County, click here. To take a train ride in Delaware County, click here. If you are so inclined, you can even reach deeper into your pockets and show a little love for the big undertaking that is my first documentary: Disappearing Rails. A short film to raise awareness about the importance of of keeping Upstate New York heritage rails in place for our economy and future generations. Filming for this documentary, the brain child of Ben Rounds, local musician and major proponent of the railroad, begins this Sunday October 22 during his Whistle Stop Tour. We hope to include footage form this tour along with original Ben Rounds music to produce a small teaser of the film before year’s end. But time is of the essence, and so is money! The reporter in me will make sure the film addresses both sides of the issues. Historians will be interviewed, along with rail/trail activists and trail-only supporters. Politicians will be given an opportunity for an on-camera interview. If they decline, that will be documented as well. And if the rails are ripped up during production, well, it will be on film. For all the world, or at least the State of New York, to see, and to know, who is responsible. I am not being dramatic here, Ulster County’s opening of bids to remove rails was slated for October 12 and has been moved to October 19. If you would like to show your immediate support for the rails, here are details of the Whistle Stop Tour. Show up! At one, or all stops. Your presence will make a difference. 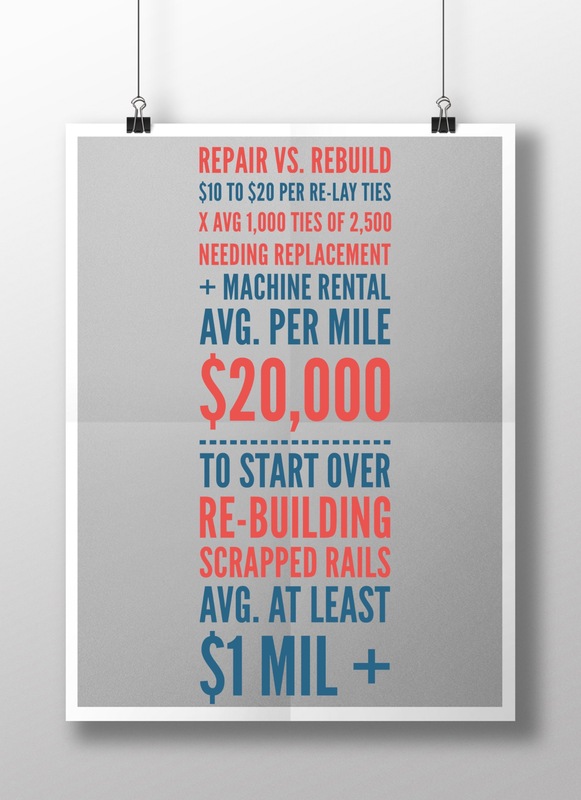 If you are more of a behind the scenes supporter, or a business owner directly affected by the fate of the rails, consider being a sponsor. Ben and I are funding the teaser on our own, but the film itself is going cost too much money without outside contributions. All sponsors will receive thanks plastered throughout our promotional campaign and spending will be transparent in readily available reports. At an April 2017 UC Historians meeting Mike Hein declared that history tourism was on the rise and it was his and our job to ‘preserve and protect’ Ulster County’s history. Really? Did anybody get that on record? If not, its ok, I will give Mr. Hein an opportunity to repeat those encouraging words again when I request an interview. Very nice article. Back in the mid-1960s Massachusetts’ MBTA (Mass Bay Transportation Auth.) bought all rails from Boston out to about 35 miles, and some even further than that. Then in the early 1990s the MBTA decided to put the former Old Colony RR tracks back in service after being abandoned in the late 1950s and early 1960s. To the disdain of some home builders, they discovered they had encroached on railroad ROW. They protested loudly and long, and in the end, they lost, both they argument and some of what they thought to be their land. The greater part of the Old Colony is now a part of Boston’s commuter rail system. Strong ridership developed immediately and has grown steadily. The MBTA is still trying to re-open long abandoned lines but with costs in the billions of dollars, public resistance at this point is strong. Thank you for reading and commenting! Thankfully, I do not believe we are looking at billions here, since the stretch in danger has never officially been “abandoned”. My partner and I are fervent supporters of theRR in Ulster and Delaware Counties, and would like to support the effort to Save The Rails. Pingback: Comment | U&D Railway Revitalization Corp. I rode the D U R R back on July 22,2017, and it was the most fantastic 2 hours I’ve ever spent. I did see what was left of the C M R R on the way to Arkville and it looked like death with the rusted rails and the station falling into ruins. It is an absolute disgrace that the county officials are such idiots that they’re blind to the revenue trains can bring in as well as the people visiting the area. I am the curator of my own private museum of Zoology, and as soon as I can find a suitable place, I would relish the thought of living in the country and possibly helping the railroad out. I appreciate this chance to speak out. There is nothing sadder than seeing rusted unused rails!!! I hope and pray these people will wake up and realize the damage they themselves have started!!! – Dr. Robert A. Cospito. Yes Dr. Cospito, what is happening in Ulster County is beyond a disgrace. Seeing the empty rail beds is heart-breaking. The County has stated its plans for the tearing up of the section from Phoenicia to Highmount. Rail Explorers (rail bikes) will be occupying the short stint from Mt. Tremper to Phoenicia, and CMRR still has a short run in Kingston, but even a portion of that is in jeopardy. Shame shame shame. I was young 19 or 20, naturally I had no idea what he meant, but I do now! Instead of fixing the existing rails so the trains could once again run and bring in tourists who will spend money for a historic ride, no, they do just the opposite!!! It makes no sense none at all.